Absolute Estate Sales may collect personally identifiable information, such as your e-mail address, name, physical address or telephone number. Absolute Estate Sales may also collect anonymous demographic information, which is not unique to you, such as your Postal Code, age, gender, preferences, interests and favorites. 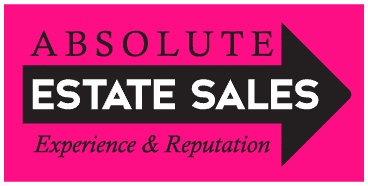 Absolute Estate Sales does not sell, rent or lease its customer lists to third parties. Absolute Estate Sales may share data with trusted partners to help us perform statistical analysis, send you email or postal mail or provide customer support. Absolute Estate Sales keeps track of the pages our customers visit within our websites in order to determine what Services are the most popular. This data is used to deliver customized content and advertising within the websites we operate to users whose behavior indicates that they are interested in a particular subject area. Absolute Estate Sales uses tracking pixels to collect information that helps us provide our Service to you. Please note that any “do not track” signals sent by your web browser or other mechanism have no effect on the collection of personally identifiable information by Absolute Estate Sales. In addition, other parties who perform data analytics for Absolute Estate Sales, such as Google Analytics, may collect personally identifiable information about your online activities when you use our Services. Third party affiliates of Absolute Estate Sales may have different policies with respect to “do not track” signals and Absolute Estate Sales makes no representations with respect to such policies. Absolute Estate Sales uses tracking to create remarketing audiences of users based on user behavior/their visits to our website. Absolute Estate Sales may also target these users with custom ads based on affinities/interests, geographic and demographic signals. Absolute Estate Sales only shares browser-level data through third party vendor tracking such as Google Analytics. Users can opt out of these advertising features by visiting Google or resources like the NAI consumer opt-out page. Absolute Estate Sales may use email addresses to target users with custom ads through 3rd party advertising platforms. Absolute Estate Sales shares customer information with third parties to perform services (advertising) on our behalf. Information about our customers, including personal information, may be disclosed as part of any merger, acquisition, debt financing, sale of company assets, as well as in the event of an insolvency, bankruptcy or receivership in which personal information could be transferred to third parties as one of Absolute Estate Sales business assets. In such an event, we will attempt to notify you before your personal information is transferred, but you may not have the right to opt out of any such transfer. Absolute Estate Sales secures your personal information from unauthorized access, use or disclosure. In addition, Absolute Estate Sales secures the personally identifiable information you provide on computer servers in a controlled, secure environment, protected from unauthorized access, use or disclosure.